LONDON: Feyenoord and Zenit St Petersburg are on the verge of Europa League exits after embarrassing 4-0 defeats to AS Trencin and Dinamo Minsk respectively in the first leg of their third qualifying round ties on Thursday. 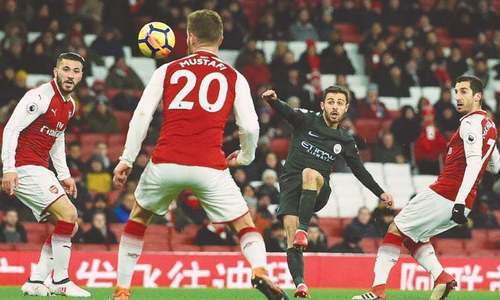 Record five-time Europa League champions Sevilla, RB Leipzig, Girondins Bordeaux and Besiktas, however, all notched up first-leg victories but Burnley have all to play for in the second leg after they drew with Turkish side Istanbul Basaksehir. Giovanni van Bronckhorst named a weakened side for Feye­noord’s trip to Slovakia and was duly punished for that decision when Antonio Mance’s double and an effort from Philip Azango Elayo put the hosts 3-0 up prior to half-time. Mance completed the rout midway through the second half, tucking in Hamza Catakovic’s cross to round off his hat-trick and leave Feyenoord, who finished fourth in the Eredivisie last season, with an uphill task for next week’s second leg. Zenit, quarter-finalists three years ago, fared no better in Belarus, Uros Nikolic hammering Dinamo Minsk ahead inside 12 minutes, Vladimir Khvashch­inskiy and Nino Galovic putting the result beyond doubt before the interval. Nikolic went on to net his second after 67 minutes and Zenit look set to join Feyenoord as early shock exits. Legia Warsaw could be another big name to go out after they suffered a shock 2-1 home defeat to Luxembourg champions Dudelange. Sevilla managed a 1-0 victory courtesy over Zalgiris Vilnius thanks to Ever Banega’s goal on a direct free kick in the 34th minute at the Sanchez Pizjuan stadium. Bundesliga side Leipzig were 3-1 winners at home to Romanian outfit Universitatea Craiova after goals from Ibrahima Konate, Matheus Cunha and Yussuf Poulsen. Konate headed home a corner form inside the box to break the deadlock in the 25th minute before Cunha doubled the lead in the 77th after a pass from Poulsen, who poked in a rebound for Leipzig’s third 10 minutes later. Universitatea Craiova got a consolation through Ivan Martic in the dying minutes of the game. Bordeaux won away by the same scoreline, defeating Ukraine’s Mariupol at the Chornomorets Stadium in Odesa while Turkish heavyweights Besiktas toppled LASK Linz of Austria 1-0 at home with Ryan Babel scoring with a header in the sixth minute at Vodafone Park. 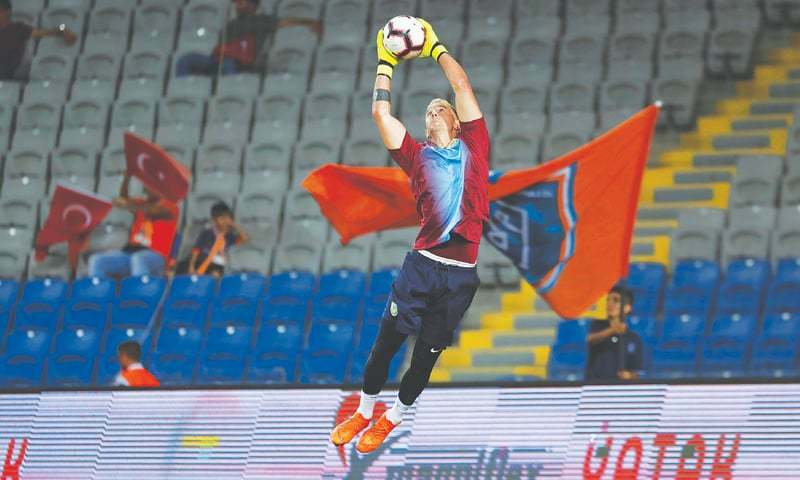 Also in Turkey, new goalkeeper Joe Hart kept a clean sheet on his debut as Burnley held Basaksehir to a goalless draw. The former England number one faced 18 shots but the Clarets’ Turkish hosts, who enjoyed 71 per cent possession, managed to get just one on target. Lassana Coulibaly’s 86th-minute goal gave Scottish side Rangers a two-goal cushion to take to Slovenia next week. Alfredo Morelos’ early opener was cancelled out by Maribor’s Gregor Bajde’s strike just before half-time, although James Tavernier’s penalty restored their advantage before Coulibaly made it 3-1 late on. Hibernian’s home match with Molde finished goalless while Cork City lost 2-0 at home to Rosenborg, who were eliminated from Champions League qualifying by Celtic, after Jonathan Levi scored twice. The New Saints face a similarly tough task after losing by the same score to Midtjylland in Cardiff, with Paul Onuachu on target twice in the first 27 minutes. Midtjylland’s Danish counterparts Brondby outplayed Spartak Subotica 2-0 in Belgrade while Ukraine’s Zorya Luhansk played out a 1-1 draw with Portugal’s Braga.